Veröffentlicht am 27. März 2017 um 12:21 Uhr. “The clouds are dark that hang over the EU. Never in its 60 years history has this European project been challenged more. In the preparation for the Rome summit we’ve seen the usual haggling, and of course one country is threatening a veto. But this Rome Summit still has a chance of being remembered later as an important stage in the process of turning the EU forward again, even if it will not produce a historic document and not overcome all our frustrations. “There is reason for optimism because there are an increasing number of people around Europe that realised that we need to fight for what we inherited with the European Union in order to keep and develop it. “The surge of the illiberal populist wave has been stoppend in Austria and the Netherlands, and stands little chance of gaining new height in the French or German elections. Brexit and Trump have shocked us, but we are showing a high level of resolve in not being overwhelmed; the support for the European project has grown and not faded in the wake of these deplorable developments. 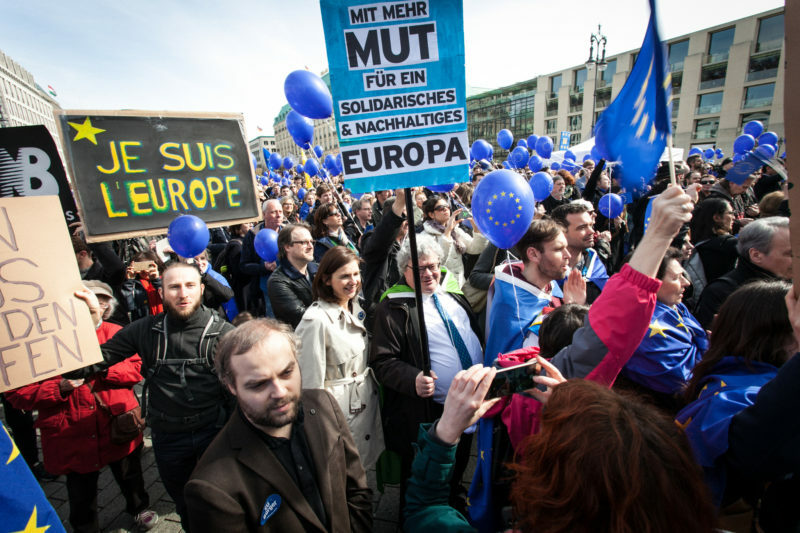 In now more than 60 European cities, citizens are expressing their active support for the European Union Sunday after Sunday at 2pm. This is a very creative and already the largest explicit pro-EU movement that we have seen in many years.